Olivier's Sprinklers, Drainage, Lighting & Roofing | Your Professional Bedwetters! Give us a try, we’ll keep you dry! 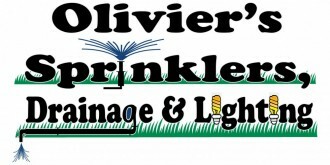 Olivier’s Sprinklers, Drainage & Lighting has been operating in the Acadiana area for over 25 years. In this span we have serviced hundreds of satisfied clients in their efforts to improve drainage, irrigation and landscape lighting at their homes and business locations. Our services include but are not limited to consultations, design and installation on new construction, renovations, existing conditions and swimming pools for both commercial and residential applications. 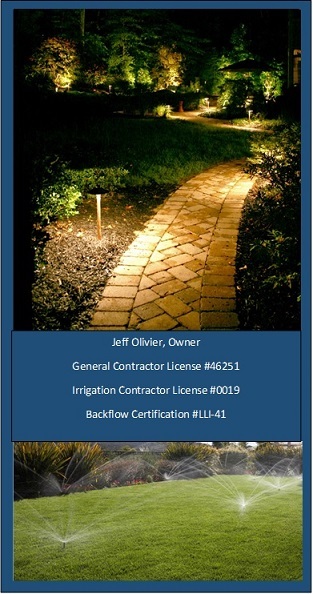 Olivier’s Sprinklers, Drainage & Lighting is a licensed Landscape Irrigation Contractor, General Contractor, and Certified in Backflows in our great state of Louisiana with many references available. Installing the right irrigation system is important. Proper function, future expandability and long term maintenance are important considerations before making a decision. Olivier’s Sprinklers, Drainage & Lighting relies heavily on the many years of experience we have installing and maintaining irrigation and sprinkler systems to make sure your dollar is well spent. Our irrigation systems have a one year warranty on parts, materials AND Labor. Have a Yard Drainage problem? We specialize in removing standing water and improving drainage around your home or business. The skills and common sense attitude we maintain in resolving your drainage problems is evident upon our initial site visit. We correct problem areas in flower beds, back yards, around pool areas, garage door areas, tie-in downspouts, relieve standing water in lawns, infiltration from adjacent properties, foundation and slab failures, etc… Our consultation is “free” and an estimate will be furnished to you promptly. We offer the latest in LED lighting technology. LED lighting will illuminate and accent your home, business and landscaping. LED technology provides for the maximum output and efficiency in lighting. Let us help increase the night time appeal of your location and provide additional safety with LED landscape lighting. Our experienced staff can assist you in evaluating you irrigation installations/ repair, yard drainage project or outdoor lighting improvements, offers solutions and cost estimates. We can help you – at affordable pricing and friendly service.